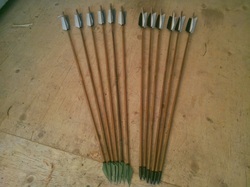 Wooden bows shoot better with natural arrows. We use bamboo shafts, self nocks, real feathers, and strong tips. Natural materials, except for some of the glues and tips. These are starting prices for the arrows. Optional choices add to this price. Please Select 25-29lbs. 30-34lbs. 35-39lbs. 40-44lbs. 45-49lbs. 50-54lbs. 55-59lbs. 60-64lbs. 65-69lbs. 70-75lbs. 80-85lbs. Usually 5lbs. less than the draw weight of your bow. Ex: 45lb. bow = 40lb. arrow spine. Please Select 26" 27" 28" 29" 30" 31"
Your draw length on your bow, in inches. This is the single feather on the arrow. Click on price to change currency.